Stars and Stripes, Bloomfield, Mo. I have never considered myself a Civil War buff. As I posted last fall, I have grandfathers that fought in the war and one was killed and buried in Columbus Ms. Our family is pretty patriotic and we love the USA. My dad was a Korean Veteran, I served in the US Air Force, along with my youngest brother, Matt, and my son, Brad. We do not appreciate folks who degrade our country in public, but they have that right because folks have fought to keep that right for them. We support the soldiers no matter where or which branch they serve in. Teri and I have some history right in our back yard and we wanted to share that with you. Bloomfield, just 6 miles north of us, was the home to the Stars and Stripes Military Paper. It was published here for the first time in November 1861. This paper continues today for our military men and women. We have a museum here and there is a Veteran's cemetary. Here are a few shots. The museum is free to the public. The US boundries in 1865 are depicted on this map. A preserved copy of the first newspaper from 1861. Shots of the Missouri Veteran's Cemetary next door to the museum. Now, just north and a little east is a Civil War cemetary and monument. Should you visit the museum, ask for directions. Not 5 minutes away from the museum. As you can see, there is a Confederate flag. This area is full of battle sights and was on the Confederate side of the war. Missouri was border state but fought for the south. They even moved the state capitol to Texas during the war. The state capitol, in Jefferson City, has one of the nicest museums that I have ever seen and lots of information on the Civil War also. Confederate gravesite just a mile east of Bloomfield, Mo. Our oldest grandson in Logansport, In. is doing a paper on the Civil War. Tyler is in the 5th grade. He and I get along very well. He asked me for a piece of Civil War memorabillia. I have several bullets from the war but I can not locate them. So, Teri and I took these photos for Tyler and hope that he can use them for his paper. I was also able to send him our family tree so that he could show the class that he has grandparents who fought and died in the war. I will end the day here just as Teri and I did our trip. Must always check out the poor man's mall. I picked up plenty of trailmix for Sam and me. Ran over to Sikeston for this shot. Hope everyone has a good day. It is windy here but sunny and 82 degrees. My kind of weather. Come back when you can. Our life is rarely boring. Look here. This guy is using his GMC Transmode to make him money. Located in Jackson, Tn. I have seen this coach a few times when we pass though Jackson but every time I have the camera ready it is gone. Gotcha today. I should have shot the tag so we could trace the vin and add to our growing list of these coaches. No one was around so I could not lift the hood. I will at least get the tag number next time if I catch it sitting there. It is right on 45, about the 6th stop light, going north, on west side of street. ouThis was about the best deal going on fuel today from Al, Ms, and Tn. It is cheaper than that in Mo. at 3.39. What a mess. This should not be but does not seem to be much we can do about it. Maybe a few tanker hijackings like we had back in the 70's. I hope not but will not be surprized. Hopefully modern technology will prevent that. If you could not tell, we had a great weekend. My brother and I get along great. He has 2 sets of twins, one year and 5 days apart. I think they are 8 and 7 years of age. Since our parents have passed, and Teri and I are older, we kinda fill in the gap for grandparents, which they have none. Can't wait to get back down to Monroe, La. and see them. Early postings show them. Teri stayed at my cousin's in Hamilton while Matt and I were in Birmingham. She had a great time also. This cousin and her husband were our witnesses when we got married. Great couple to hang out with for lots of clean fun. You can bet that I had lots of emails from my buddies about the 2 of us not looking like we fit the mold of the rednecks at the race. Oh boy, got bunches of ribbings on that. Oh well, I did not have to report to my parole officer today like the rest of them, ha. I was saved by my brother from the wrath of an upset wife over the camera deal. Teri will sure be hugging Matt's neck when we see him again. She got a lot better camera out of the deal for sure. Thanks Matt, I owe you one. She was so happy that she has not mentioned the umbrella I lost. Was a great day for a 400 mile drive in the Vibe. Matt took our 630 am wake up call and then rolled back over and slipped into another dream. At 805 am I woke up and started hollaring. Wanted to leave at 7. Oh well, what is the hurry for a guy that is unemployed anyway. Got on the road at 830. There were RVs everywhere with Mo. and Ar. tags heading north out of Birmingham. All had been to the race. Lots of Mo. boys head to that race. 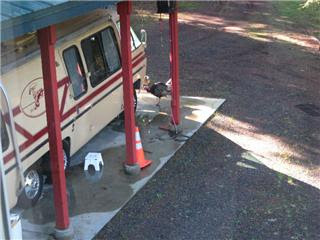 They love that rv ing thing on the grounds around the track. Most of them could not have driven after the race. Glad they waited til today to break camp. Matt said lots of RVs heading his way too, west on I-20. I was on 78. We called Matt when we were on the Ms. bridge, he was crossing the same river at Vicksburg and arrived home at same time we did. Was a fun weekend. Hope everyone that follows Nascar gets to attend just one race in person. Don't expect to see the race though. For that, stay home in front of your tv. I appreciate all of my friends that follow along with us on our rides around the country. Mostly we are in our coach. As one friends, Bill in Ohio stated, Teri and I are making priceless memories. We are probably the poorest folks spending 8 months a year in our coach but we sure have fun. Poor in financial terms. I can promise you that we are two of the wealthiest folks in friends that anyone could possibly be. We now have real friends all over this USA because of our travels in the GMC Motorhome. We appreciate each and every friend that we have. Can never have too many friends scattered around. Here we are, the day that Matt and I have been waiting for since Christmas Day. His wife, Barb, bought us tickets and pit passes for Christmas. I guess we were good boys or maybe she just wanted a break from Matt. Either way I benefited from the deal. Two happy brothers enjoying the day in the pits. Was a good time. Thanks Barbara. Do we look like typical race fans here? I will tell you this, we saw some wild dudes in there. I bet if their parole officer knew they were in there drinking beer they might have a problem. A few shots from the pits, before the race. We took a ride around the track. Look at the banks on this 2.6 mile track. Hey, we made the pre race show on Speed Channel this morning. Wish I had been home so I could have seen us. I told Matt not to hollar, wave, or pick his nose while camera was on us. Just stand here and we will stick out in the crowd because we look like two normal, intelligent, fellas. I don't think you can see this fella looking at me too good. If you could you would know why I took this shot. Lots of guys here look like him. ou Ok, this is a shot as they blew by us. Only one I got so you could see the cars in the picture. They came by fast. NEarly 200 mph. Tony Stewart limping in after he took out a few cars on lap175. Well, it has been a great day for two brothers to hang out. We will say our good byes in the morning. He will go back to Monroe, La. and I will run up to Hamilton, get Teri, and head home. I bet Sam will be glad to see us Monday. The shirt I had on came from our oldest daughter, Stasha, and family, for xmas. I might not have had a shirt if not for them. Had a hat to match but we left it in the motorhome. Wore a free cap I got in Ca. I killed our display on Teri's new camera. Had it in my pocket and sat on it. Messed up the display. My brother just gave me a better camera so I will not be in the doghouse. I appreciate him for that. Also, lost Teri's umbrella. They gaurd would not let me take it in. So, I placed it, along with Matt's brand new one, over by the fence. Well, they were long gone when we came out of the race. Imagine that. It was a very good day but the race can be better seen from our front row seat at home in front of the tv. Everyone should attend just one of these if you like racing. Gives you a chance to see that the drivers and crews are real people just like us. They just happen to make a lot of money. Yall have a good evening. Hope you had as much fun as we did. Wow, Did You See the End of Today's Race? This is a very pretty state. Sometimes I wonder why my grandfather left here. I guess the cotton was whiter in Southeast Mo, after they drained all the swamps. Nice state to visit. This place has alligators that have moved all the way up to the Florence area. Matt and I took a drive over to the track this afternoon. We waited til the Busch Race had already started wo we would stay out of traffic. Hung around there for an hour and came back to the motel and saw the last 20 laps on ABC. That was a nailbiting few seconds there at the last. I thought Jr was going to take Stewart. Just was not to be. I know a lot of fans over at the track were sad. 88 signs everyw here over there. Look at these photos. I have never in my life seen such a sight. I bet these folks have been here for a week, at least. There are rvs and tents everywhere. What a sight. Gives you a funny feeling to come into this. I know tomorrow will be something. I just hope we can get out of there alive. We should have some great photos. Miles and miles and acres and acres. I mean, this was a sight to behold. No telling how much money this race weekend brings into the area. Matt and I could hear the noise when the cars rounded the north end of the track where we were mostly. I am glad we ran over so we have some idea of what to expect in the morning. We will leave here very early trying to beat some of the traffic. It is about 60 miles east of us on I-20. The blimp was leaving as we pulled up to the place. The big wreck happened while we were outside and we could see the big plume of dust. Redneck City does not come close to describing the sites we saw. I bet folks come here to rv and never go inside the track. This has got to be one of the best fan supported races of all. Matt was at the Texas race 2 weeks ago and he said the outside of the track looked nothing like this. What a sight. Folks selling everything, everywhere. Tickets for sale were all along the side of the road. I suppose they buy large lots and pedal them for higher prices this weekend, I don't know. We saw some wierd looking folks. Tatoos, long beards, long hair on men, short pants on girls with barely tops. Hmmm. And look at this. Our good friend, Rob Allen, got this shot this morning at his house in Idaho. 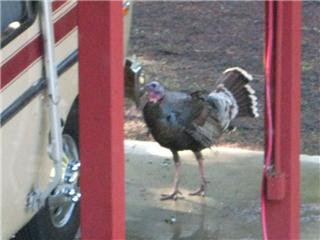 The turkey was warming up to his GMC coach. I told him it looks like a banny rooster in disguise. I really appreciate you dropping by today. Try to come back late Sunday evening. I suspect it will be late when we get back to the motel, but if I feel like it, I will share our day with you. Oh, almost forgot. When Matt and I walked into the front door of the motel a guy asked us how to get to the track. I said, "do we look like two guys who might know anything about Nascar?". Oh boy, I thought I looked better than a typical race fan that could be spotted from 100 feet away. Kinda hurt me. Yep, the little guy is another grandchild of our's. 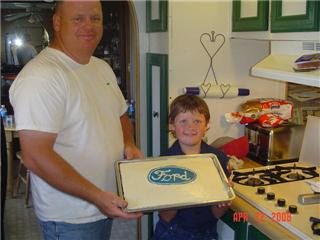 Josh and his dad cooked a cake for cub scouts. This little guy is going to the state of Arizona Pinewood Derby finals. We are proud of him. He has done a lot of things in the cub scouts and is very active in 4H. Josh has learned to be very responsible for an 8 year old. He often rises very early and travels to the ranch with his dad to perfom ranching duties, either on the back of a horse or on a 4 wheeler. Hardley ever complains about his daily chores. Josh is the middle child and shows his affection for both his older sister and his younger brother. Josh lives in Duncan, Az. Can't wait to get back and see him. Temperature got up to 85 degrees here today. Was great. I got the yard mowed and Teri accomplished a lot. Trying to get ready for our trip to Alabama Friday morning. I guess tomorrow will be packing day for us. 5 minutes and I am ready to hit the road but Teri will insist that we work much slower. Looks like a good chance of rain for next few days. Just hoping no rain for the race. Thanks for dropping by. I just wanted to "spotlight" our grandson, Josh. He and I are real buds. Here are 4 reasons that we are back home for a while. I know you understand. Had some friends emailing me to make sure I was alright. Had not heard from me since my last post when Teri needed to talk with me. Yea, I am still around. It was a serious talk but not anything bad. She just needed my full attention. Now, what in the world is going on here? I walked into the kitchen this afternoon and this is what I found. Was a funny site to me. Everyone knows that Teri loves to cook. She also loves crafts. Well, she is emptying this small banny chicken egg so she can have the whole sell, in tact. I mean she got all of the egg out of the shell without breaking it. I think she did a dozen of the little suckers. It was amusing to me but it won't be if she finds this picture on here, shhh. It does feel good to be home for a few weeks. We will head to Alabama Friday morning and be back here Monday evening. I have a doctor appointment tuesday morning. The reason I had to give up ice cream, cholestrol. I should pass this test. I failed the last one. Rained this morning right up til noon. We got 1/2 inch. Sun came out and it was 80 degrees again. Possibility of thunderstorms rest of the week. I hope it does not rain in Alabama while we are at the races but I am taking my umbrella just in case. If you watch the race, look for the only 2 guys not drinking beer, that will be my little brother and me. Don't click the link left on my last post. It is just advertizement for some German flowers or something. Dog gone it. They got me again. I thought the post was odd but, well, maybe the guy is just kinda illiterate. Nope, he was slicker than me. I was in a hurry and let it pass. Oh well, I am a little slow myself. Good learning experience I guess. Now, maybe I can say "won't let that happen again" and mean it. I have to chuckle. There is nothing bad on the link, just crazy that some guy in another company would want his advertizement on my blog. Doe he think folks actually read what I write? Well, I failed to rise on Saturday as planned. The day before was just a bit much for me. So, nope, I did not get to the church building to help cook for the ladies. Shame on me. I should have known that I could not get up at 630 am two days in a row. My image is not totally ruined now. And the rain fell. I don't know how much more water this area can take. It rained all afternoon. Teri and I got up early, 630,and drove up to Cape Girardeau to get a few things. Had lunch at Sam's Club. Boy, they make good pizza. Left there about noon and it rained like crazy all the way home, 55 miles. We took on Hobby Lobby first. I kept the front bench warm there for an hour. Then over to the Dollar Tree. That cost us a lot more than a dollar. I got 20 bags of trail mix for Sam and me. That is great stuff and a lot cheaper than Walmart. For you boondockers, it is a great place for led lights. The hockey pucks with 3 lights are only a buck. Also the reading lights and laptop lights. We have them all over our coach. They have some pretty good stuff in there. I have considered buying all the led lights they have and opening an ebay store. Should be able to double my money. Our daughter called us over for supper tonight. Had ribeyes cooked on the grille. Got to play with the 3 grandkids. We loved that. We miss them when we are traveling. Well, back to the earthquake. Teri and I did not wake at 430 am because of the quaking earth but Sammy did. Teri then got up and took care of her. There was a second tremor about 930, or so, that we did not feel because we were on the road and the wind was blowing us so hard all over the place. Would have been no way for us to feel that one unless the pavement opened up. Noticed a lot of traffic out today. Guess the fuel prices are not stopping folks much. I tell you one thing, I have a scooter that gets over 80 mpg. It will see a lot of use while we are home this time. Hope everyone has a great weekend. The men are cooking for the ladies at church in the morning. That means another early rising for me. 2 in a row, killing my image. I forgot to take a picture of the yard before we started working on it. I mean it was looking rough. But, the neighbor's yards looked just as bad. I guess it has just been too wet here for anyone to mow grass and clean up the yards. I had to mow our's twice today, that is how bad it was. Teri pulled a bunch of weeds, you can see some of them before she bagged them up. I am hoping it will be warmer Wednesday and I can do some weedeating. It is nice to be home again. I will be ready to go again as soon as we get things cleaned up around here. Tried to start our scooter today but it was too cold and had been sitting too long. I will roll it out into the sun tomorrow and let the metal warm up. It will start then. I don't know why there is no choke on it. I had no problems with the mower, it has a choke. Here is one reason I get called the "king of wifi" sometimes by friends. If you look close, just under the tv antenna, there is a 2.4 mhz high gain directional set of stacked yagis. Works really good at 50 feet in the air. The Verizon wireless is doing a great job so I will be using it from now on. I like using the same internet setup in the coach, car, and house. Keeps things simpler. Just grab it and go. Some of my friends have asked me to describe the mobile internet system that Teri and I are now using. Many of you already know about this so it will be a boring day for you. I tried to do my research before I purchased this system. I learned a lot about this setup from the escapees forum. For a couple of years I had been looking into the satellite system but it had several drawbacks for me. One of those being the fact that I had nothing while moving down the road. This setup gives us that feature. Over the last 2 years this system has come a long way. The first picture is of the usb card plugged into the mobile wireless router. These are small. The router is size of a pack of cigarettes, the modem is half that size. The usb modem can be plugged directly into your laptop. I don't like that, too easy to break it. With the router this is all hidden away from the computer and nothing is hooked to laptop. The modem is the Verizon 720, made by another company. Cost, 20 bux with 2 year contract at the time we bought it. The router is the Cradlepoint 350. Cost was 130.00. Both of these items came from the 3gstore.com. Don't go to Verizon phone store. They sell phones and service. Most know nothing about the internet that rides on the back of these cell towers. Get these two items on line somewhere. The laptop talks to the router via the internal wifi card or an external wifi system. The second picture is of the 3 watt, dual band, amplifier. It amplifies both transmit and receive signals. It is marketed as a cell phone amplifier but works fine with data. I got it on ebay for 130.00, new. Wilson makes a good amp but it is twice the price. I thought for this price I could gamble and it paid off for me. There are other brands available. Make sure that they are "wired" and will work on both bands, 800-900 mhz and 1900 mhz. By "wired" I mean they use a cable between the modem and the amp. There are "wireless" amps but tke my word for it, get the "wired" for the mobile use of internet. On the right side of photo, between amp and the green light on modem, you can see the "wire". It is a small coax cable that hooks the modem to amplifier. Same as if one was using this for a cell phone. This cable came with my package from the 3gstore.com. The cheapest place to purchase these are at Flying J truck stops. Make sure you know which coax cable connector you need if you go there. 10.00 at truck stop, free with my order. The third photo is of the entire setup, including the small mag mount antenna that I use on the car. I have not cleaned it up since the blizzard. On the motorcoach we have a larger Wilson Trucker, 40 bux. This mag mount was 15 bux. Make sure antennas are for both bands of operation. In the motorhome I have a spot for all of this hidden. In the car I put it behind the driver seat, out of the way. In the house, well, lets say I am in trouble. Teri is not happy that it found its way to the kitchen counter. I have been given a directive to get it moved tonight. Will put it in the den, hidden and out of the way. This is so easy to grab and take with us. We will head to Cape Girardeau in a day or two for Sam's Club. I will throw it in the car so I can surf the net while Teri shops. The amplifier came with ac and dc connectors. The modem feeds off the router. The router came with only ac connecting brick. Dc was 30 bux so I opted not to buy it and use a small cigarette plug inverter for it. I hope I have described this in a simple way. There is absolutely nothing complicated about this. Maybe a little easier for me to understand as I have been a ham radio operator for over 30 years, but trust me, this is simple setup. The cell companies have come a long ways with fast internet in last few months. I love having internet that I can take with me as we travel or use in our house when we are home. I have another antenna in case we get too far out in the boonies from a Verizon tower but I won't discuss that here. You will not need it. We do camp in the boonies sometimes. If you keep your motorcoach at home, just leave this in there and use it at home. the wifi works pretty good for 300 feet. If you need more you can get it with an external wifi antenna on the laptop. The Cradlepoint does not have external wifi antenna connector, but I may modify mine for one. I am sure it can be done. We chose Verizon because they are ahead of the others with coverage and with high speeds. We get unlimited service for 60 bux a month. They caution not to use streaming video on this or they will charge the user once we go over 5 gb. We lost internet for 10 minutes between Tucson and Yuma. A couple of spots on Hiway 50 in Nevada. Had a couple spots where speeds were slow but still was very good. I am sure the other companies will catch up later but for now, Verizon offered us the best for our money. If you have questions just give me a hollar at gregg_danathotmail.com . I will do my best to answer, but make sure you put mobile internet in the title or it will hit my trash bucket. AND, here is one happy puppy. She loves sleeping on her bed at home after 4 months on the road. She does really well for being over 12 years old. Here are some pictures of our trip on Friday, 900 miles. It was 2350 miles from the Pacific Coast, in northern Ca. to our house here in Mo. This is what we had once we got back on I-70 Friday about noon. This was not the word I was thinking of when we left Colorado. Nearly every well was pumping. Lots of new pumps too. I think Kansas gets a bad rap. The 400 mile drive is not that boring. Lots of high rolling plains. Just enough to keep a motorhome from operating in "cruise" mode. The car handles the inclines just fine. New windmills just west of Abilene, Ks. Look what Teri found growing in our yard when we pulled in. She had to clip some and bring inside the house. We drove 1450 miles in 25 hours. Too long, especially the last 2 hours in the blizzard conditions. It was total whiteout when we stopped and checked into the motel in Limon, Co.
900 miles the second day was not a bad trip at all. Weather was good with no precip. Strong winds and lots of overcast but hey, that was a breeze compared to where we had been the day before. One thing we noticed on our trip home was the traffic was very light. Saw few trucks the whole way home. The ones we saw were trying to get over that pass. I do not know why the traffic was so light but it was. Maybe folks are going on strike due to the high fuel prices. It does feel good to be home but I miss our coach. I will be ready to hit the road again long before Teri allows us to go. We do have a trip scheduled in 2 weeks. Heading to Alabama where Teri will visit with my cousin while my brother and I go to the Nascar race near Birmingham. Make sure that you keep linked to us here. There should be some interesting things popping up from time to time. As always, thanks for the visit. We appreciate everyone that drops in and the time we spend together.